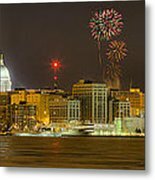 Panorama showing New Years Eve, 2008 fireworks in Madison Wisconsin. Also available as a spectacular black and white image, and without the fireworks. This panorama is special, in that 2008 was the last year fireworks were fired form the bank building on the square. This is a panorama of 3 photos, and each of the 3 I took 7 photos, one stop apart, with a longest exposure of 30 seconds. I then added 3 photos of the fireworks. 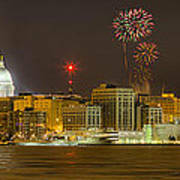 All were taken New Years Eve from Olin Park. 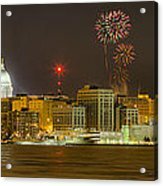 The panorama is also available as a spectacular black and white image, and without the fireworks.